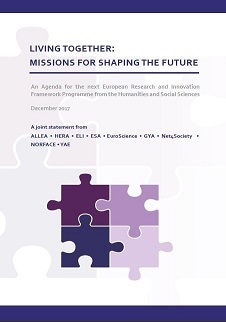 Organisations representing the Social Sciences and Humanities (SSH) in Europe have published the joint statement “Living Together: Missions for Shaping the Future”. The signatories call for more inter- and transdisciplinarity and a conscientious framing of ‘missions’ in the future EU Research and Innovation Framework Programme 9 (FP9), putting forward suggestions that take account of social, cultural, legal and ethical challenges ahead. The statement responds to a call by the High-Level Group on maximising the impact of EU Research & Innovation Programmes, the so called “Lamy-Group”, to “adopt a mission-oriented, impact-focused approach to address global challenges”. It stems from a joint initiative by HERA (Humanities in the European Research Area) and ALLEA. In case you would like to show your support to the statement as an organisation, you can do so by writing a short message including the name and the logo of your organisation to kaiser@allea.org. You will then be added to the list of supporters below.